The last two decades have seen a spate of retrospectives of artists who had been written out of the dominant canon of White art history during the apartheid years. Exhibitions on the lives and artistic output of Dumile Feni, Louis Maqhubela, Gerard Sekoto and George Pemba come to mind, as does 'Revisions', which showcased Bruce Campbell-Smith's superb collection of work by South Africa's historically unsung artists. This retrospective of Peter Clarke at the South African National Gallery in Cape Town, a collaborative effort between art historians Elizabeth Rankin and Phillipa Hobbs, is another such revisionist project. The exhibition is testimony not only to Clarke's prodigious talent, but also to Rankin and Hobbs' thoroughness and dedication. Their decision to present a scopic overview of Clarke's development as an artist puts the emphasis on the biographical (and hence, inevitably, socio-political) context of Clarke's career. The exhibition does not, therefore, necessarily display only the 'best' of Clarke's oeuvre, but includes juvenilia, sketch books and minor works, and sometimes multiple versions of a single design in various media, including preliminary sketches. Although exhibitions with such a biographical and inclusive slant are often criticised for a lack of selectiveness, a retrospective on decades of significant output justifies such inclusivity. I personally found the inclusion of contextual sources and historical and biographical information poignant, and the educational value of this information must not be under-estimated (two school groups visited the exhibition while I was there). 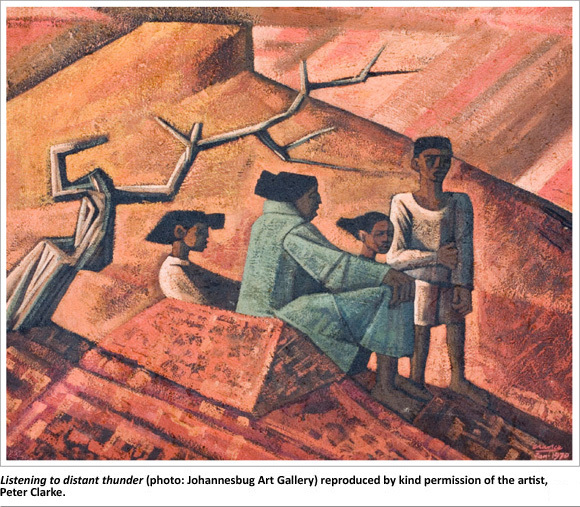 For most of his life, Clarke was designated a 'Coloured' artist and unjustly made to represent the entire, complex experience of the marginalised communities of the Western Cape. The inclusion of biographical data on Clarke particularises his experiences and practice, nonetheless providing evidence of the degree to which they were shaped by the economic and political forces of the apartheid era. The fact that Clarke, to this day, does not have a studio, but works from his home in Ocean View (to which his family was relocated under the Group Areas Act), explains the small scale of most of his work, but also poignantly situates his unfortunate use of cheap and mostly inferior materials. Clarke's output in the 1960s and 1970s consisted mostly of small linocuts and woodcuts, which display his strong sense of formal design. The small scale of these graphic works precludes complex statements, which is a mixed blessing, for there are gems among them - beautiful, simple vignettes, in which Clarke's distinctive use of strong, sweeping lines is allowed to shine. But many of these prints are rather derivative genre scenes and townscapes, indistinguishable from thousands such scenes by other artists. To my mind, it is in his paintings that Clarke's talent sparks, and it is a pity that there are so few of them. Clarke's aptitude as a colourist emerged first in the Teslaarsdal paintings he produced as a young artist, and flourished later in powerful allegorical landscapes such as Listening to Distant Thunder, which provided the evocative title of this retrospective. Although the paintings are not big, they are monumental and very affective. While some of the lighter themes (such as his flute player), remind of Maggie Laubscher's faux naive style, it is Clarke's moody and somewhat foreboding combination of human form and landscape that most impresses. These paintings are distinctive, and while they could (and have been) compared to Picasso's proto-Cubist work, they bear a unique and unmistakable imprint. Because they mostly avoid overt political messaging, Clarke's paintings are enigmatic and suffused with atmosphere and mood. These paintings are vibrant, glowing with strong colour and a dynamic thrust of clashing diagonal planes. This contrast between idyllic subject matter and restless, almost violent, formal language makes for particularly engaging and compelling viewing. The same can, unfortunately, not be said of Clarke's big collages, which he started producing after he attended a Thupelo workshop in 1985. Thupelo did not do Clarke any favours - I find collages such as Trojan Horse bombastic, literal and formally boring, and the use of gouache on paper makes for a tawdry effect. Compared to the earlier paintings, which relied on suggestion for effect, these collages are pedantic and entirely stripped of Clarke's distinctive formal language. In 1962, Neville Dubow wrote of Clarke's one-man show that Clarke's '...primary purpose [was] to make pictures and not social statement'. If only that had remained true. However, there is a glimpse of Clarke's playful, powerful artistic energy in his latest, small, book collages. They are delightful, small, intimate, colourful - reminiscent of the small, hand-coloured woodcuts of his youth. While one cannot but understand and sympathise with Clarke's strong identification with the political struggle, it is regrettable, on so many levels, in his practice as an artist. After 1994, I started feeling that one must also explore other things beyond the statement. I felt it was a time for liberation, a renaissance... So I gave free reign to working with various kinds of material like coloured paper, cloths, labels and whatever. He also said that he was particularly interested in people, and 'If I decided only to work in a figurative way, there would be no end to what I want to say about people'. Perhaps this points the way forward for Clarke? For me, his strength always resided in his treatment of the human form, and in his abilities as a colourist and formalist.